A few years ago I posted about the original Surface tablet. I praised it for its portability, slim keyboard cover, free Office and amazing battery life. I still use mine to write, surf the web and entertain my daughter. However, the device can be a bit limiting with only one kickstand option slow processor. Today I would like to introduce you to a true laptop replacement, the Surface Pro 3. It all beings with a slimmer design, faster processor and 8 hours of battery life. That stuff may not be exciting to non-techies, but it is very important. It will enable you to load applications faster and work longer. Why is this device such a great buy for writers? Where do I begin? For one, you can buy a keyboard cover to make sure you always have a fast, accurate keyboard anywhere you are. Any time inspiration hits, just flip open the Surface and get writing. The kickstand can be positioned to any angle you need. Writing on a tabletop with a pen? Flip it all the way back. 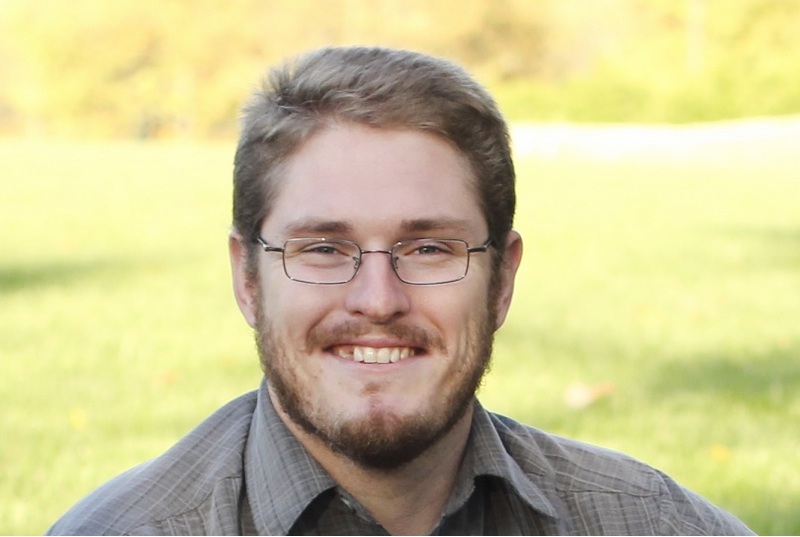 Writing at a desk with a keyboard? Position it at any angle you choose. But those are mostly novelties. What’s the reason to sell your old laptop and get a Surface as a replacement? Glad you asked. It, of course, runs all Windows applications, including Office. You have Word with you anywhere you go. And all of those Word files can be stored in the cloud via OneDrive. When I update my latest story on my Surface, it saves automatically to the cloud. If I go home and want to continue working on the story on my desktop PC, the story is there waiting for me right where I left off. Canvas mode. Perfect for creating. Not only will you have access to 6GB of free cloud storage with OneDrive so you can work on your documents and have them sync seamlessly between your PCs, there is also a USB port and MicroSD slot on the Surface. Let’s say you are out at a conference somewhere and there doesn’t happen to be Wi-Fi. All you have to do is carry your documents with you on a USB Memory Stick, external hard drive, or MicroSD card and you are ready to go. Or, of course, store them directly on the device itself. Write directly on the screen. Send edits and comments in your own handwriting! 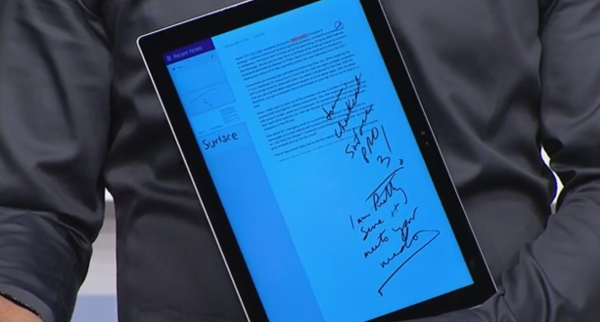 For those who like to write by hand, the Surface Pro 3 also comes with a special pen. This digital pen will allow you to instantly write on the go. Just simply double click the top of the pen (just like a real life retractable pen) and your Surface will wake up and launch OneNote. What else can you do with this pen? Well, there’s Photoshop, Paint, etc. You can also write directly into Word or OneNote and it will convert to digital text. The perfect compromise for those who still wish to write by hand! You can also write directly on Word documents for editing, proofing, etc. and those notes will be viewable by any other person an any PC. Cool stuff! 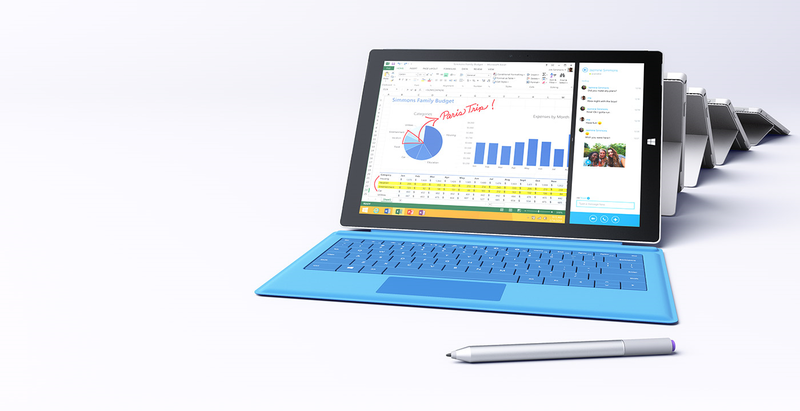 The Surface Pro 3 is the perfect device to travel with you to the next writers convention. Leave your bulky laptop at home and get just as much work done in an even faster time with your Surface. 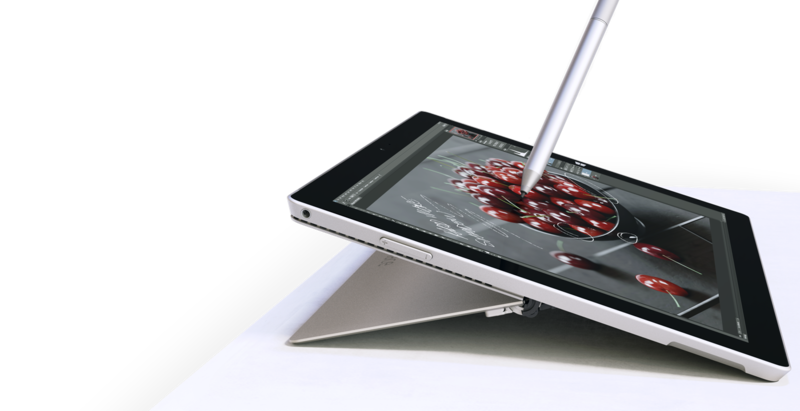 Surface Pro 3 is available for preorder at the Microsoft Store.